The van is powered by a new four-cylinder OM 654 diesel engine. Not only has Mercedes announced that it will be showing off a refreshed V-Class MPV in Geneva next month, but we can expect to see a fully-electric MPV concept to make an appearance, too. 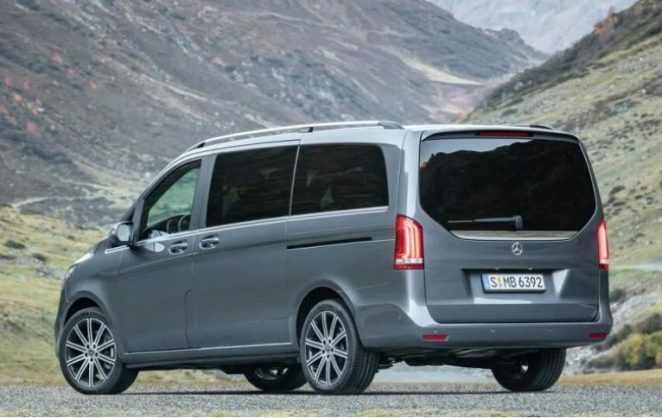 Back in 2014, the Mercedes-Benz V-class multi-passenger vehicle made its world premiere, and next month at the International Geneva Auto Show, a refreshed version of the model will debut with a sportier design, new engine options, and more safety tech. At first glance, changes to the exterior body design are difficult to find apart from the new paint colors. If you look a little closer, though, you’ll see that the whole front end has received a series of subtle upgrades including a wider, revamped bumper design with cooling air inlets and a new radiator grille pattern with chrome pins. Additionally, owners have the choice to select from a series of light-alloy wheel designs varying from 17-inches to 19-inches. Likewise, the interior received a set of upgrades that enhance the van’s sportier aesthetic and make the vehicle more tailored to its owners. You’ll find new air vents in “a more sporty tribune look as well as new dials in the instrument cluster,” and there are six total seating upholstery options in a variety of leathers and other fabrics. The front row now fully reclines and is equipped with back massage and climatization functionalities. The van is powered by a new four-cylinder OM 654 diesel engine (with various output variants) that is, “even more efficient and clean and offers further improved noise and vibration characteristics.” The seven-speed automatic transmission has been replaced by a nine-speed version, and the model now comes standard with rear-wheel drive. Active Brake Assist can now issue a warning if it detects a front collision risk and automatically modifies the brake pressure accordingly to “suit the requirements of the situation.” Furthermore, the optional Highbeam Assist Plus can adjust the headlights to prevent other drivers’ vision from being obscured by your brights. Additionally, Mercedes-Benz announced that they will premiere a concept MPV at the Geneva Auto Show in Geneva in March, a near-production ready model of a battery-powered van.